Keith Natti weaves between other surfers at Good Harbor Beach in Gloucester. Keith Natti recalls a blistering 6-degree day last winter with 30-mile-per-hour winds. 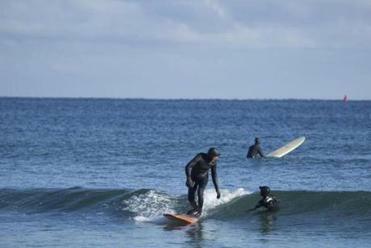 Surfing is only one of the activities that draw visitors and locals to the shores north of Boston during the summer. But when daylight begins to fade and the air begins to chill, the surf community stands alone. Hamilton resident and Beverly native Patrick Belmonte has been surfing since his teens. Now 33, he is a cofounder of Change is Simple , and environmental education nonprofit based in Beverly. With the temperatures averaging between the low 20s and high 30s from January to March, one of the biggest obstacles these surfers face is the consistency of the surf. In recent years, Natti, Belmonte, and others have noticed an uptick in the number of those willing to throw themselves into the freezing Atlantic waters. 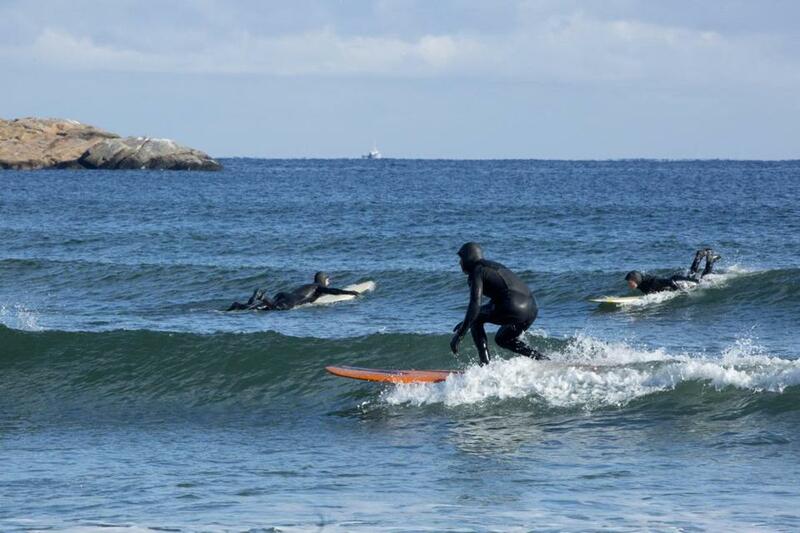 That’s in part thanks to advances in wetsuit technology that allow surfers to stay warmer longer. The local surfing community is tightly knit. It’s more than just braving the cold, but also a matter of protecting their playground. Pennsylvania native Jim Vincent Jr. moved to Gloucester in 1996 after spending his younger years surfing the Jersey Shore. He is also a cofounder of Humans for Oceans, a group based in Essex that raises awareness about the ocean and conservation. Belmonte said he regularly surfs with others ranging from 15 to 65 years old. “It’s a hearty group, lots of beards, lots of jokes all the time,” he said. “It’s more about the friendship and experience than about our competition. It’s more about sharing stories and passing our boards around. Alexandra Malloy can be reached at alexandra.malloy-@globe.com.